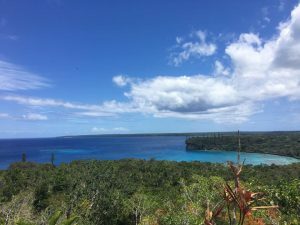 “Wake up, you need to see where we are!” That is the exact reaction I had when I first laid my eyes on the island of Lifou. Lifou was our second port stop on our Pacific Island Hopper cruise with P&O on the Pacific Dawn. I had made a habit of going for an early morning walk to the 14th deck during our cruise. On this particular day what a site I was met with. We had sailed into the sheltered harbour some time during the night. The Pacific Dawn would spend the day anchored out from shore. The smaller tender boats would ferry people back and forth throughout the day. I was compelled to high tail it back to our cabin to wake the family up. 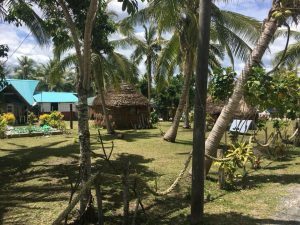 Now, they may not have appreciated the 6am wake up call at first but once seeing Lifou, well their reactions changed pretty quickly. The first thing that hits you is the blue. The clear blue of the sky. The crystal clear, blue water surrounding the island. The next thing is the green. The green of the island that would stretch from the cliff face to the left to the cross rising out of the trees to the right. If there was a definition of paradise, then this was as close as you could get on this trip. We were greeted on the pier by two locals in pirate garb for the obligatory “P&O” photo. 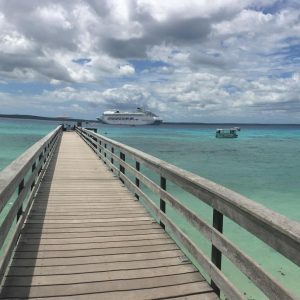 While P&O do offer various official tours on Lifou, it seemed most people on our cruise elected to run to their own tune. Many made for the clean white sandy beach to stake their claim on a piece of beach real estate for the day. 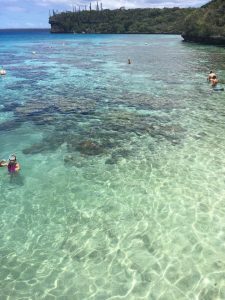 This would definitely be how we will choose to spend our next visit to Lifou, but more on this later. 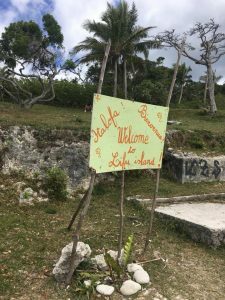 Once past the pier and the sign welcoming you to the Island of Lifou you are greeted with a small market area where souvenirs, hair braiding and drinks/snacks are all sold by cheery and happy locals. The cruise crew had established a cold water station next to the pier, which was incredibly well received. It was a hot and steamy day on Lifou when we visited so keeping the liquids up would be important. The girls decided to partake in the hair braiding. This afforded the boy and I time to wander the market area and take some good photos. This included the almost must-do “holding the ship” shot. Australian dollar was accepted everywhere. We would recommend taking small notes like $5 and $10. After about half an hour the girls were done and must say the work on their hair was superbly done. 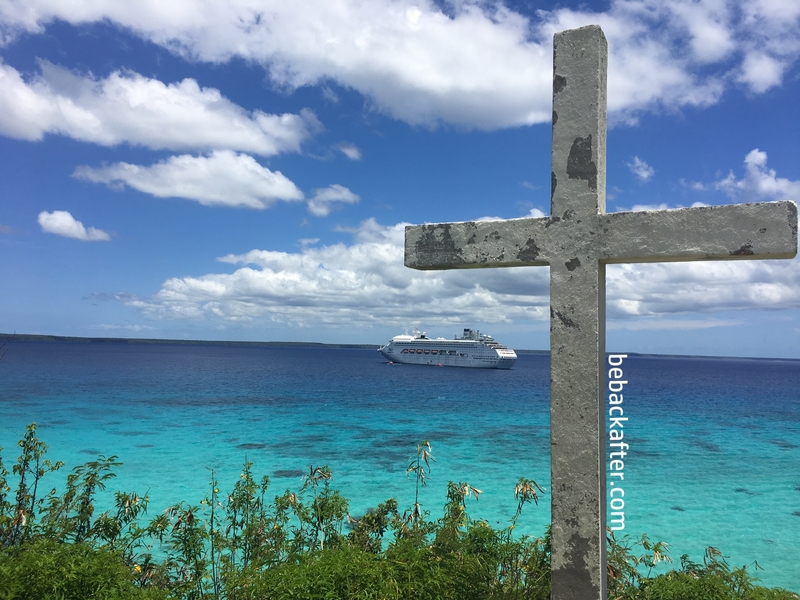 We headed off to go for a walk to see the sites of Lifou. After walking through the markets, we started to head towards the little church on the cliff that we had seen from the ship. 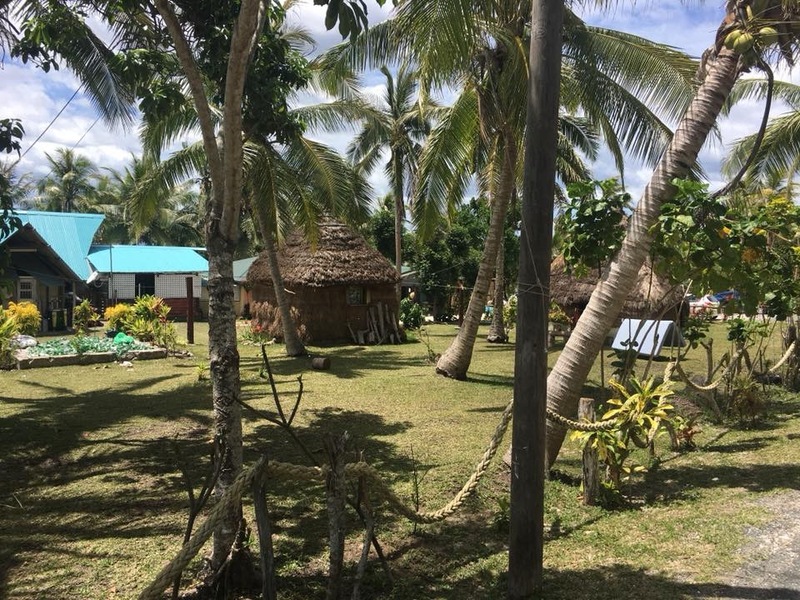 We wandered past some traditional huts until some fellow passengers mentioned they had too tried to find the church but the road ahead was cut. We eventually worked out we had to walk a little further up the hill directly behind the markets to the actual main road. Two hand written signs directing cruisers to Jinek Bay and Cave were at the crossroad. Each trip, apparently, would take 5 minutes and 3 minutes respectively. 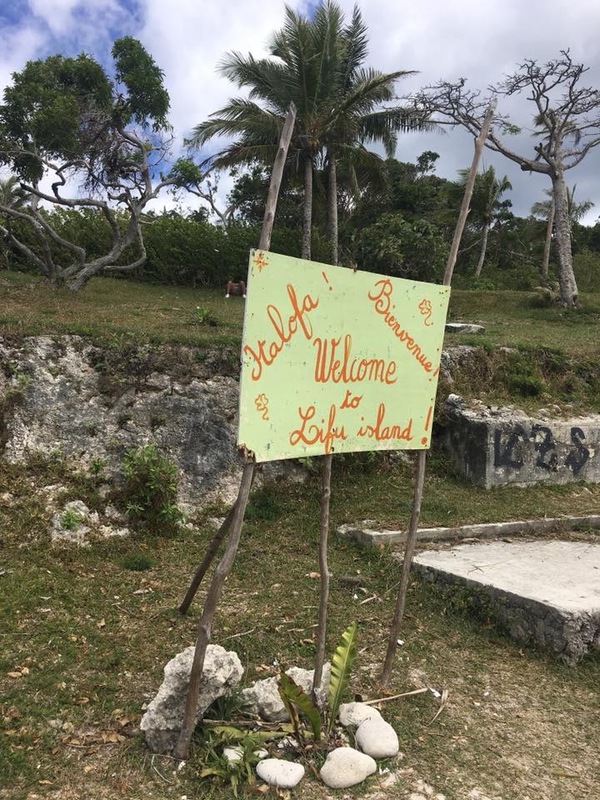 Note of warning – apparently those living on Lifou either have no concept of time or we walk way too slowly. The walks were well longer then the signs mentioned. Turning left at the main road we eventually made it to the end of the trail where the stair climb would take us to the small church, known as Notre Dame de Lourdes. Between 50 and 60 stairs later and the view from the church made the climb all worth it. You will overlook the bay in which your cruise ship is anchored with the rich blue tapestry of sky and sea before you. 100’s of butterflies danced around as we caught our breathe and enjoyed some water. (Make sure you bring your water bottles filled with water from the ship. Our visit was very warm and humid and if you follow the same site seeing we did, you will definitely need to keep liquids up). Notre Dame de Lourdes itself is a small little building, yet it is beautiful in its simplicity. It clearly has many stories to tell. If so inclined you are free to light a candle or spend a moment in prayer inside. 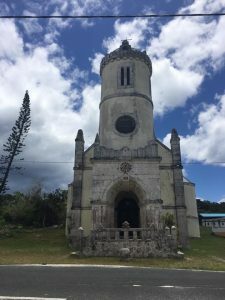 There are two observation decks around the church, affording majestic views. On our walk back we decided to detour to Jinek Bay, which was just a short stroll off the main road. 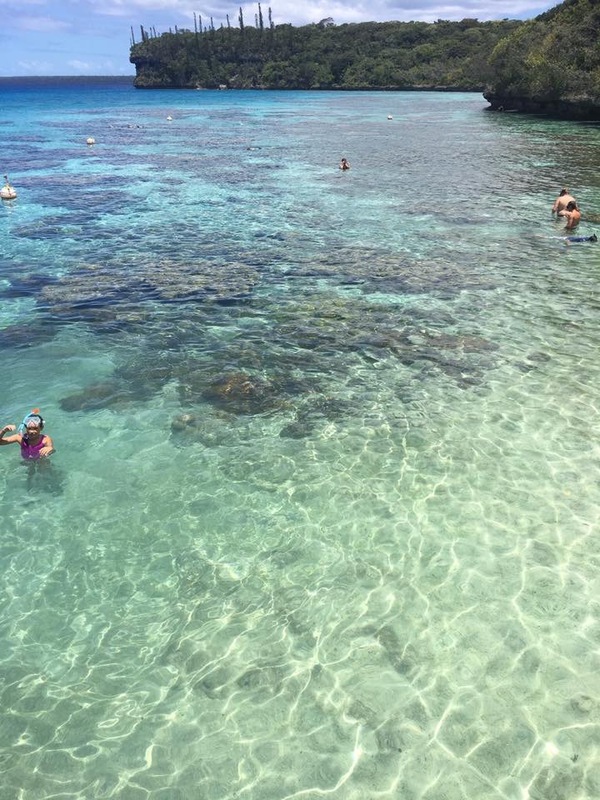 A truly magical spot where snorkelling is a must do activity. This will certainly be a must-do on our next visit. I am not sure I have seen clearer water anywhere! Wandering back along the main road we came back to the area near the markets where we came ashore. Walking past this we wandered past huts and homes. 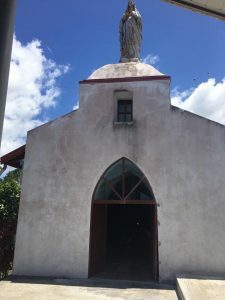 Eventually we came to another large church where a walk to “the cave” began. Now we were told it was a 2 minute walk which meant 2 minutes to the entrance. It would be much longer to the actual waterhole! I would not do this activity in just thongs, as the climb at times requires sure footing. After making our way through caves and climbing down, the space eventually opened up into a tranquil forest. 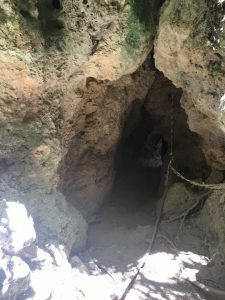 Following the steep path we came to another cave with a small opening that we managed to squeeze through. Greeting us was a natural water hole where everyone was taking turns to jump in. The water was freezing, dark and deep. Quite an experience. The only downside was having to climb all the way back out! Upon our return, we noticed an opening in the tree line on the opposite side of the road next to another building. Exploring this was a great decision as it led to an outcropping where an old cross had been erected many years before. This spot affords one of the best opportunities for panoramic shots that we found on Lifou. Wandering back to where we started, we found a nice little spot on the main beach to enjoy a nice cooling down swim in the clear waters. The sand was white and the water cool and clear. Snorkelling is possible in these waters with stunning results including being able to swim with turtles. 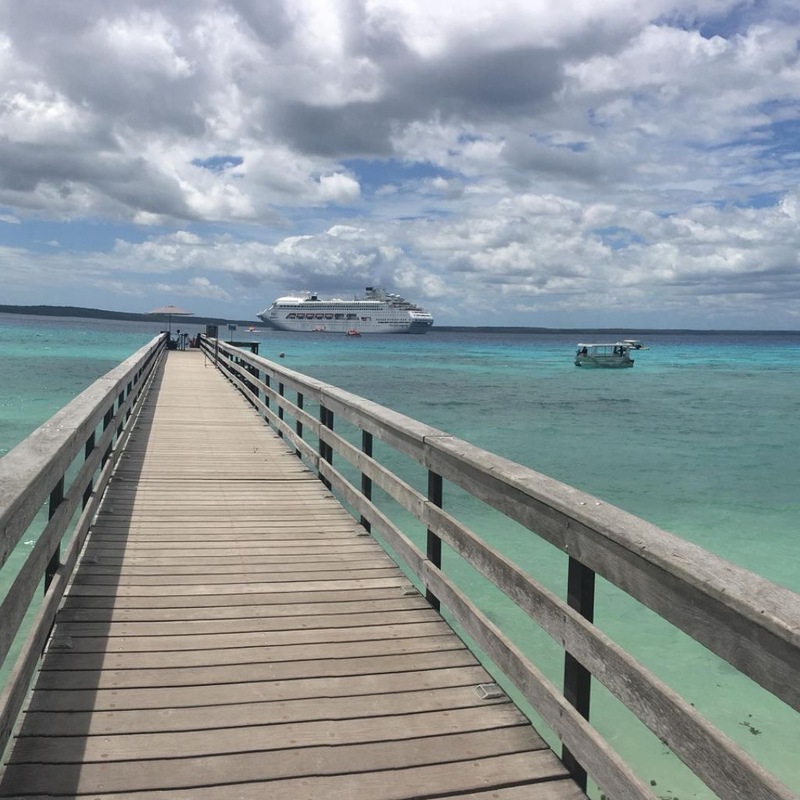 We were definitely sad to leave Lifou. It was a fantastic little piece of Planet Earth that we will definitely return to again in the future. As if in a farewell of its own, while we were lining up on the pier to get a tender back to the Pacific Dawn, a turtle of its own accord swam up to the pier, stuck its head out fo the water as if to give us a wave, sunk again beneath the waves and swam off in the same direction from which it had come. A more fitting farewell the island could not have given. 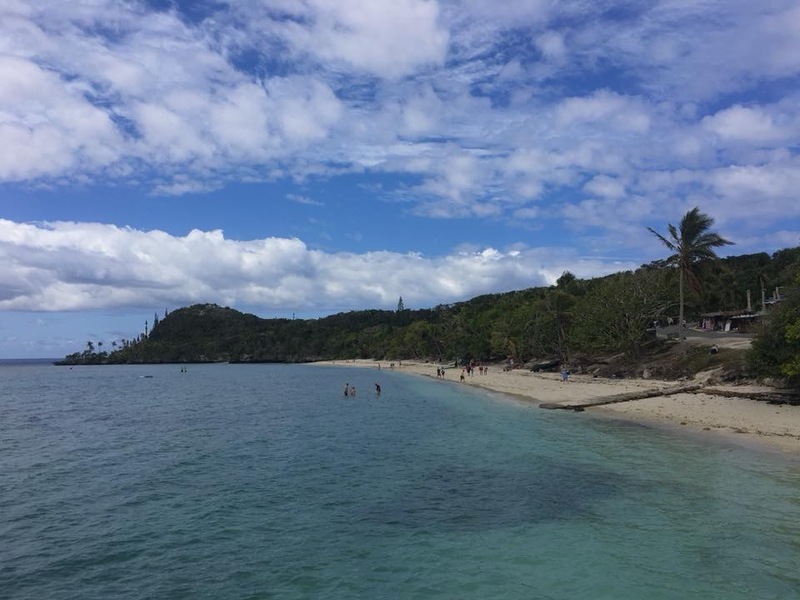 – Snorkelling is possible around the pier where you arrive. If on the pier itself walking towards the markets, head to the right side of the beach. The island looks so beautiful. Cruise port spots are so lovely. Snorkeling in clear water is the best. The video is nice and well made. Previous Another Airport. Another Trip.